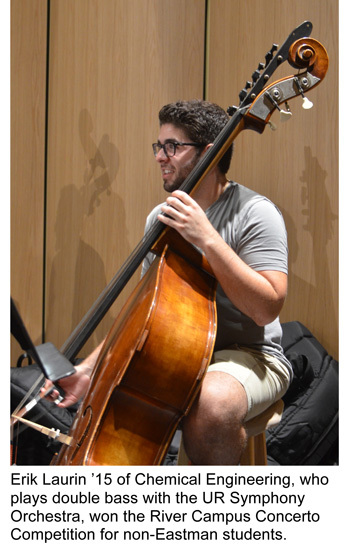 When chemical engineering major Erik Laurin ’15 isn’t figuring out ways to optimize the use of heat exchangers to minimize energy consumption, he’s likely taking lessons on his double bass at the Eastman School of Music or performing with the University of Rochester Symphony Orchestra. Laurin plans a career in chemical engineering. But he also expects his passion for music to remain a lifetime hobby. That’s one of the major reasons Laurin chose to attend the University of Rochester. “When I was accepted, it was an obvious choice that I had to come here because of the Eastman School”—one of the nation’s top-ranked music schools. Yina Jin, a PhD student in computer science, became interested in playing the carillon “mainly because this is the largest instrument I’ve ever seen.” She is one of the student carillonneurs who study under Doris Aman, an adjunct instructor in the music department and coordinator of the University’s Carillon Society. Jin and Laurin are not alone among Hajim School students. An estimated 18 percent of the Hajim School’s full-time engineering students took music lessons or courses in fall 2013. The percentage of humanities credits earned by engineering majors, as represented by enrollment in River Campus music classes and ensembles, has increased from 9.2 percent in fall 1989 to 23.1 percent in fall 2014, according to an analysis by John Podvin, director of institutional research for Arts, Sciences & Engineering. Music and engineering at the University intersect in other ways as well. Audio and music engineering, for example, is a new major that draws on the expertise of Eastman and the Department of Electrical and Computer Engineering faculty—including Grammy Award– and New York Emmy Award–winning musicians and studio engineers—to train students in the audio, music, and sonic arts. 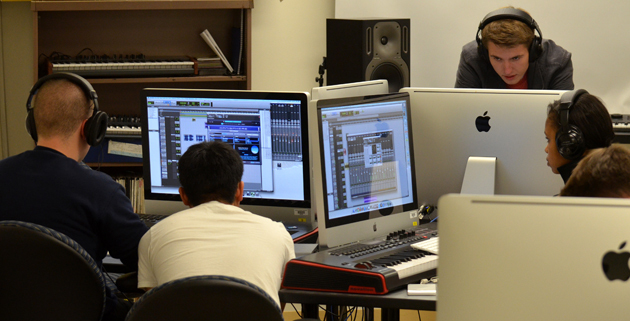 Drop by a session of AME 193, shown in photo above for example, and you will find students using top-of-the-line studio equipment and recording devices to create sound tracks under the watchful eye of Rob LaVaque, a lecturer who is a two-time New York Emmy Award–winning professional musician and audio engineer. For their final project, his students take movie trailers stripped of music and sound effects and create their own. “Sound design is one of the coolest things I have ever learned about,” says Stephanie Roman ’16 who partnered with classmate Renjin Zhao ’17 to create—from scratch—a very spooky sound bite about a Halloween haunted house. Roman has decided to switch her major to digital media studies with a concentration in sound. The intersection of music and engineering has also led to some fascinating inter-departmental class projects and research studies. A team of five students in assistant professor Ehsan Hoque’s human-computer interaction class, for example, worked with Eastman voice professor Katherine Ciesinski and her students on a computer app to help singers perfect their vowel sounds. One of the more intriguing student collaborations is the Laptop Orchestra that David Heid, a master’s student in electrical and computer engineering, assembled to perform at last fall’s Rochester Fringe Festival. 5th grade elementary students from Plank Road North Elementary performing a hybrid drum circle/Wii remote composition that featured vocal percussion recordings of the University of Rochester Yellowjackets. Music composed for and performed by facial gestures. The piece was written by Eastman graduate student Edo Frenkel, who created a new form of music notation to accommodate this unique performance. A composition in which a tap dancer “becomes the instrument” as software translates the tapping of feet into synthetic sounds. Heid, who has undergraduate degrees in electrical and computer engineering (from the Hajim School) and in music education (from the Eastman School), says he wanted to show how art, science, and technology could be blended in creative ways. Laurin, who won the River Campus Concerto Competition for non-Eastman students in November, will perform the first movement of Antonio Capuzzi's Concerto for Double Bass and Orchestra with the UR Chamber Orchestra on April 28.